You can Special Summon this card (from your hand) by Tributing 2 monsters with 2000 or more ATK. During the Battle Step, if this card battles an opponent’s monster (Quick Effect): You can target that opponent’s monster; banish both this card from the field and that target. Return those banished monsters to the field at the end of the Battle Phase, and if you banished an Xyz Monster, this card gains 500 ATK for each material it had when it was banished. Blue-Eyes stats on a cool effect monster? Sign me up. Galaxy-Eyes Photon Dragon really is BEWD with an effect that destroys XYZ Monsters when it attacks them. You can Special Summon GEPD by tributing 2 2000 Attack monsters. It might not seem better than just Normal Summoning it, but the option is better than not having an alternate Special Summon option. There are also many new ways to get GEPD on the field and Rank away. GEPD makes XYZ Monsters better when it is used as material. GEPD also can utilize a lot of BEWD support. The old battle step effect to get monsters off the field until the end of the Battle Phase is not as useful as more Extra Deck monsters exist now, but the deck is stronger and more consistent than ever. Finally, as a protagonist/antagonist theme, there will probably be more support coming down the line. Looks awesome too. 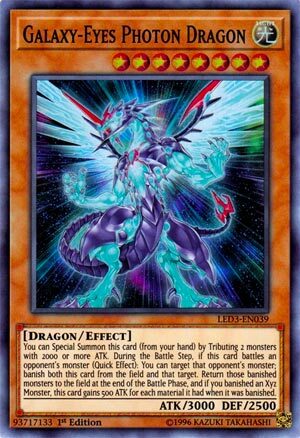 The final Throwback Thursday for this themed month is the important piece of Galaxy/Photon strategies (I considered reviewing Galaxy Knight instead, but this card is so important to Photon/Galaxy), Galaxy-Eyes Photon Dragon. Galaxy-Eyes is a Level 8 LIGHT Dragon with 3000 ATK and 2500 DEF. ATK and DEF are great, LIGHT and Dragon is great. You can Special Summon this from the hand by tributing two monsters you control with 2000+ ATK. Nice to have a Special Summon effect, you won’t do this every time, you’ll probably summon this off Starliege Photon Blast Dragon, Galaxy Knight, Galaxy Expedition, or Galaxy Transer from the hand, deck, or GY (Galaxy Solider will put this in the GY easily), but the effect it has to summon itself is nice to have. If this card battles an opponent’s monster (Quick Effect), you can target that monster and banish it and this card from the field until the end of the Battle Phase and if this card banished an XYZ Monster with materials attached to it, Photon Dragon gains 500 ATK for each material it had before it was banished. The banish effect is useful if Galaxy-Eyes is threatened in battle, the ATK boost from banishing an XYZ monster won’t come up too often, but I guess it can be nice back-up. Galaxy-Eyes Photon Dragon synergizes with so many cards in the Photon/Galaxy deck and thankfully has a pretty solid effect to where it doesn’t feel like a complete brick. Galaxy-Eyes Photon Dragon is overall a solid card. Art: 4/5 Kinda like the purple and pink it has, really complements the blue Photon effects it has on it. Throwback Thursday for the final week in Legendary Duelists is Galaxy-Eyes Photon Dragon (first reviewed here: https://www.pojo.com/yu-gi-oh/CardOfTheDay/2011/Oct/21.shtml ) We did look at it once more, just a couple months later at the end of that year. Anyway, Light, Dragon, 3000 attack (2500 defense) and all of those things have only grown in support since the initial release. So, while a bit odd, the Special Summon ability is nice, requiring two Monsters with 2000 or more attack. Probably easier to bring out GEPD simply as a revival from the Graveyard, or maybe a more specific Deck piece, than giving up two cards, as that’s not always the most likely to happen…and you may not always have the two Monsters that meet that requirement. GEPD can remove itself and the Monster it’s battling during the Battle Phase (as a Quick Effect) and returns them both to the Field at the end of said Battle Phase. GEPD gains 500 attack per XYZ Material of an XYZ Monster removed as a result of this effect. This card is, more or less, the heart and engine of a good Galaxy/Photon Deck. There are plenty of variants these days, but most require this card in one way or another. Still, it’s a card that’s good after so long. Art: 5/5 The original, here, definitely has the best, and most cosmic art (in my opinion).